When I taught preschool art classes, I did a spin-off unit involving one of my favorite books: Harold and the Purple Crayon. 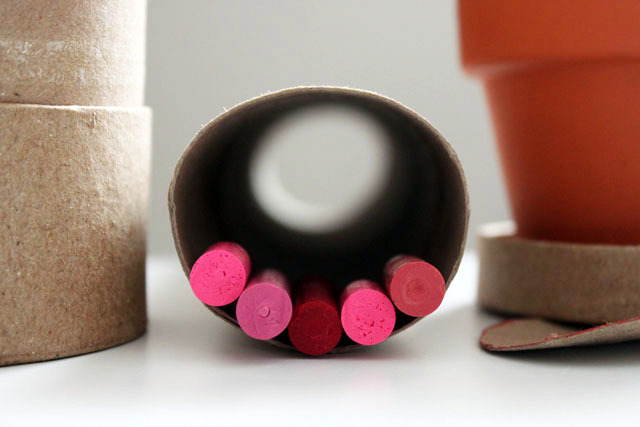 Kids made “Harold-sized” crayons as thick as their grips and used them to create new worlds all over the stark white walls. By the day’s end, we were surrounded by colorful cities, jungles, rivers, stars, and abstract environments. It was wild and cozy. 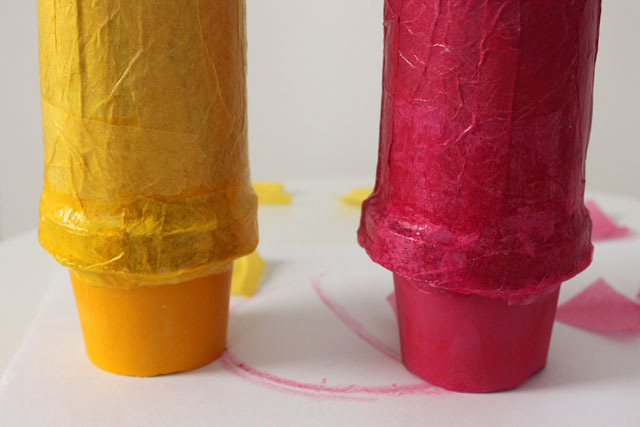 Though I am not currently teaching any art classes, I still save paper tubes and broken crayons. 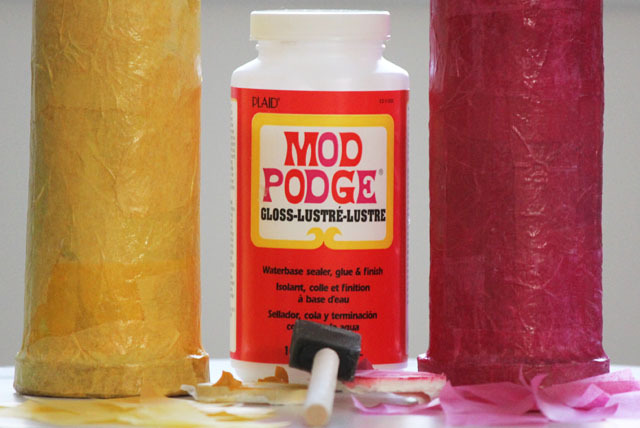 Using those supplies, along with Mod Podge, tissue paper, and tape, I made hollow container versions of the big crayons for my niece and nephew in their favorite colors. 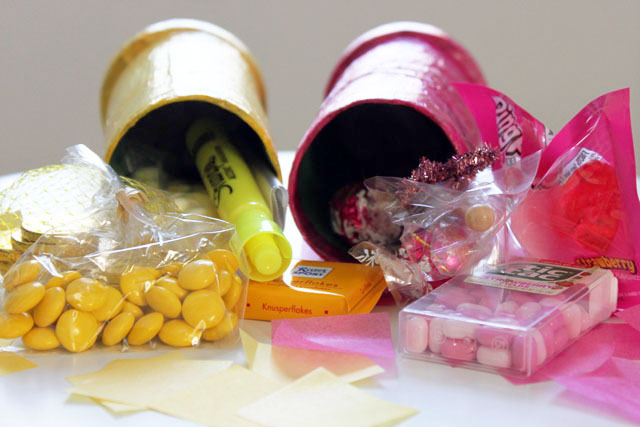 Once everything dried, I filled them up with coordinating goodies and sent them in the mail for Valentine’s Day presents. Those two sweet rascals color up my life so much. I hope they always stay true to their colors while their hearts and imaginations continue to grow. P.S. Yes, I am a child of the ’80s and have a Cyndi Lauper sing-along every now and then. Keep ’em shining through! P.P.S. 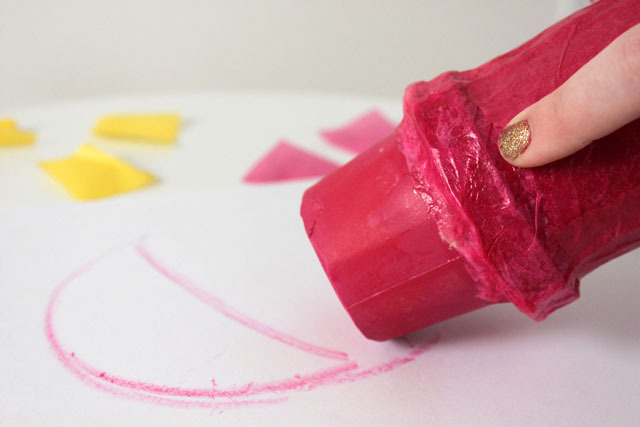 Melt down your own old crayons into exciting new shapes and colors: peel away the papers (great way to occupy little ones while encouraging sorting, recycling and fine motor skills) and put the colors in an oven-safe form. 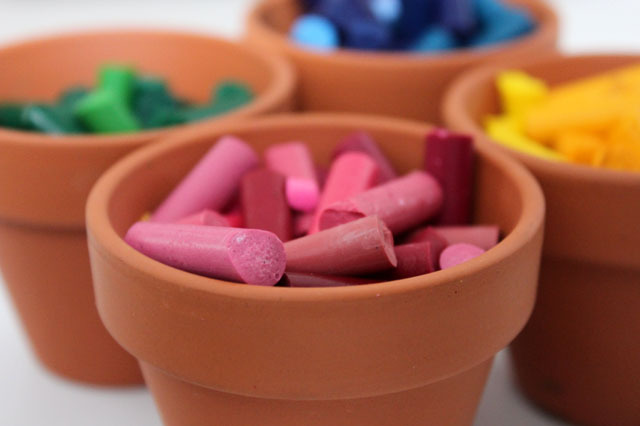 I have used muffin tins, cups, flowers pots, etc. Place in 275-degree oven for up to 30 minutes. Allow to harden, then pop out of form. You can make me a purple one sometijme! will do. and I won’t stop until the whole box of Harold crayons is complete! As soon asi read the title the song was immediately stuck in my head. Also a child of the 80’s used to teach preschool and this is awesome! You never cease to amaze me with your creativity and thoughtfulness to those around you. I adore this post! Thanks for sharing the ideas and these gorgeous photo’s.